The convenience of a table that folds can be a liability when it is laden with food. One way to ensure that the table does not collapse at an inopportune time is to use a butterfly catch pull to lock the leg rail and support block together. Eating outdoors is one of life's simple pleasures. Whether it is a picnic, a barbeque, or something more elaborate, dining al fresco always adds something special to the experience. The patio table and the folding picnic table shown in this chapter are both excellent additions to any outdoor furniture ensemble. The patio table (page 80) is large enough to seat six adults comfortably. It is, in fact, as big as many dining tables. The table does not seem imposing, however, mainly because of the lattice-work grid that comprises the top. This gives the table a light appearance, and literally reduces the weight. While it is not as portable as the picnic table, it can be moved easily by two people, or even one in a pinch. manageable with the help of the indexing jig shown on pages 88 and page 134. The folding picnic table (page 90) offers a convenient solution to the need for a table that is transportable. It is designed to fold down neatly and can fit inside most car trunks. 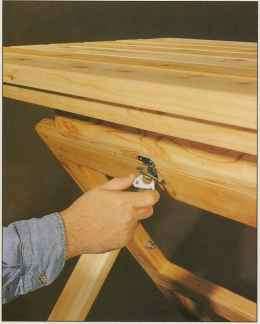 When locked in the up position, the table provides a sturdy surface large enough to seat four adults. Its construction combines the use of prefabricated parts and building to fit. While the top can be made made by referring only to the cutting list (page 92), the legs must be planned carefully so they nest inside each other and must be trimmed to the right length and angle as the last step (page 96). 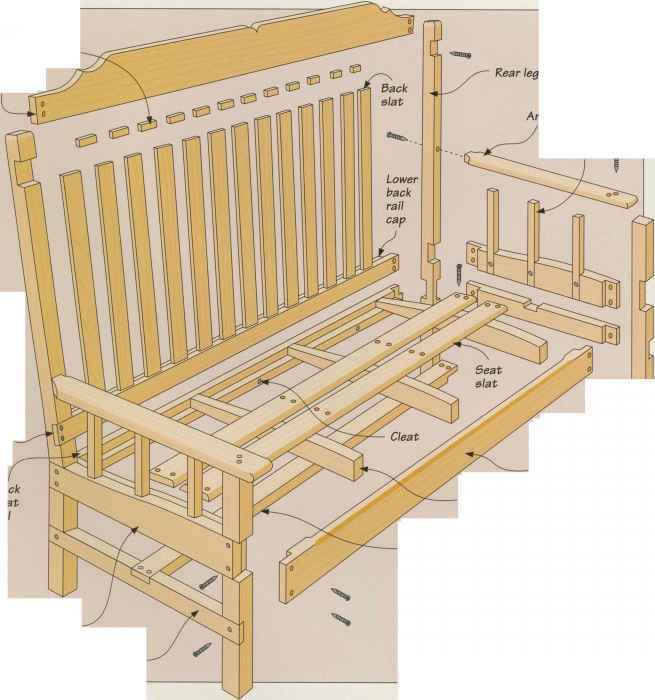 A useful companion to both tables is the keyed tenon bench (page 98). It is attractive, simple, and exceedingly strong. Sometimes called a joynt stool, this is a very old design that could have been found outside an English cottage four hundred years ago. However, it looks perfectly at home on a contemporary deck or patio. Its simple design makes it easy to build to whatever length you need. Simple change the length of the slats and stretchers listed in the cutting list as required. A lattice top makes a table much lighter, but remember not to make the holes too large or glasses will spill easily. The spaces should be no larger than l'U inches square.